to the attention of Syndic Literary Journal. 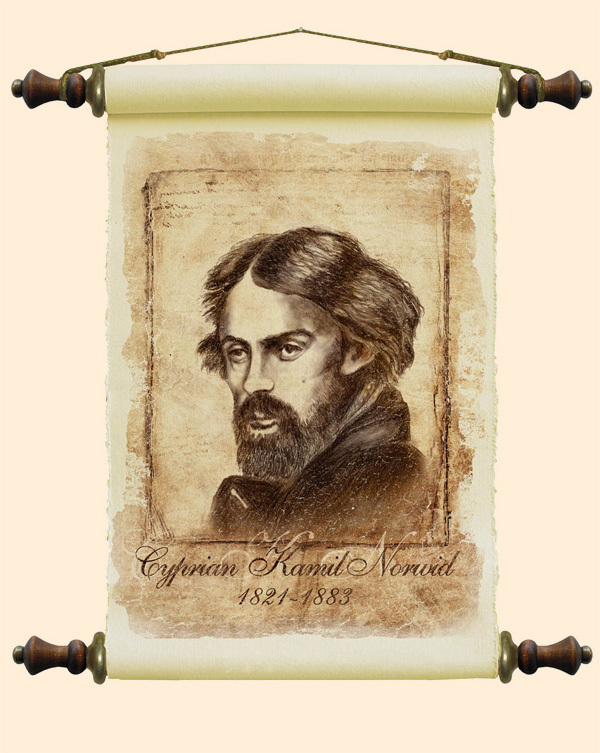 “Cyprian Kamil Norwid, a.k.a. Cyprian Konstanty Norwid (Polish pronunciation: [ˈt͡sɨprjan ˈnɔrvid]; 24 September 1821 – 23 May 1883) is a nationally esteemed Polish poet, dramatist, painter, and sculptor. He was born in the Masovian village of Laskowo-Głuchy near Warsaw. One of his maternal ancestors was the Polish King John III Sobieski. Norwid is regarded as one of the second generation of romantics. He wrote many well-known poems including Fortepian Szopena (“Chopin’s Piano”), Moja piosnka [II] (“My Song [II]”) and Bema pamięci żałobny-rapsod (“A Funeral Rhapsody in Memory of General Bem”). Norwid led a tragic and often poverty-stricken life (once he had to live in a cemetery crypt). He experienced increasing health problems, unrequited love, harsh critical reviews, and increasing social isolation. He lived abroad most of his life, especially in London and in Paris, where he died. What Did You Do to Athens, Socrates?